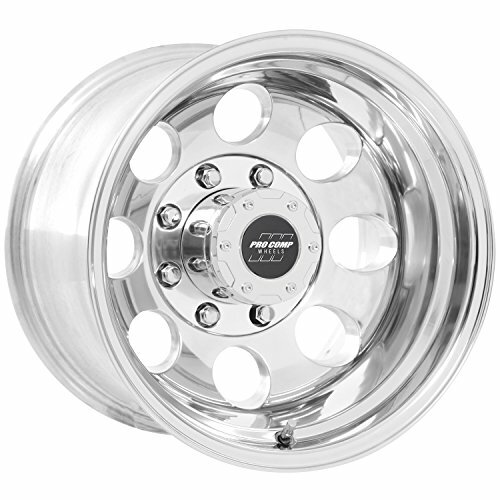 Set of 2 Tire and Wheel Assemblies Wheel Color: Hustler Chrome Silver Wheel Size: 8x7 4 Bolt Holes 4" Bolt Circle Disc Offset .90" Bolt Hole Size .716" Tire OD: 17.9 Tire SW: 8.26 PSI:22 Load Rating at 10 mph: 615 lbs..
Set of 4 Tire and Wheel Assemblies *** Wheel Color: Almond *** Wheel Size: 8x7 *** Pilot Hole: 2.83" *** Number of Bolt Holes: 4 *** Bolt Hole Size: .590" *** Bolt Circle: 4" *** Offset: Centered *** Tire Size: 18x8.50-8 *** 4 Ply *** Tread Code: ATW-009 *** Non-Directional *** DOT Approved *** Tire OD: 17.72 Nom *** Tire SW: 8.46 Nom *** PSI: 22 *** Load Rating at 10 mph: 815 lbs.. Fits all EZGO, Yamaha and Club Car carts without a lift kit! 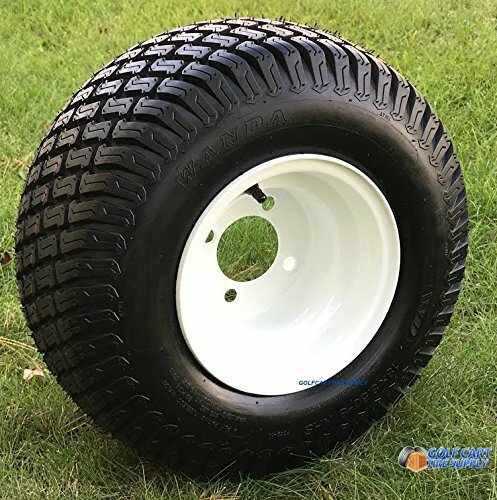 Clean up the look of your cart or replace those damaged rims today This smooth riding OEM replacement set from high-performance manufacturer, SLASHER, is great! 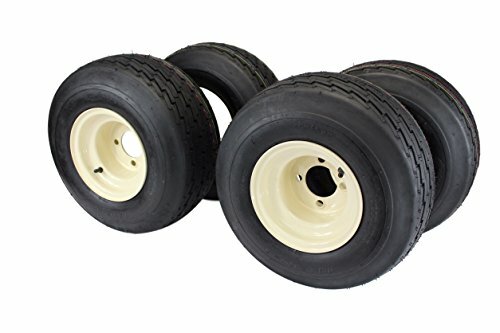 This wheel and tire combo kit will perfectly replace your OEM golf cart wheels. 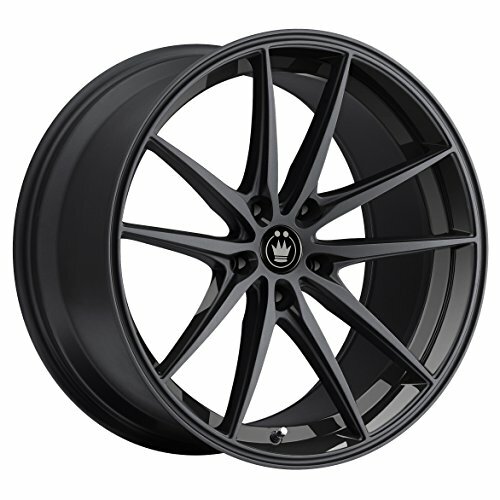 Features a universal 8" BLACK steel wheel and 18x8.5-8 size tires. Just mount on and go! The Slasher GTX 18x8.5-8" tire provides great traction in the rain or shine. This combo is the best choice for original equipment (OEM) replacement on golf carts. TECH SPECS:Tire size: 18x8.5-8 Tire height (ground to top of tire): 18 inches DOT Approved? YES Turf Safe? 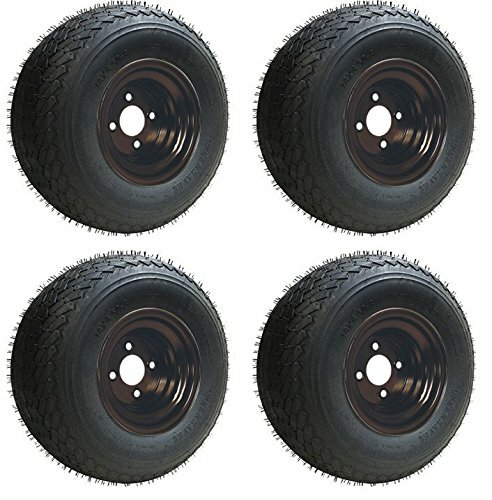 YES Ply Rating: 4 ply Load Rating: 815 lbs @ 22 PSI Wheel Offset: Centered (3.5 + 3.5) Bolt Pattern: 4x4 (101.6mm) **Make sure these are "SLASHER" branded tires when you receive them. Perfect for your stock or non-lifted golf cart. 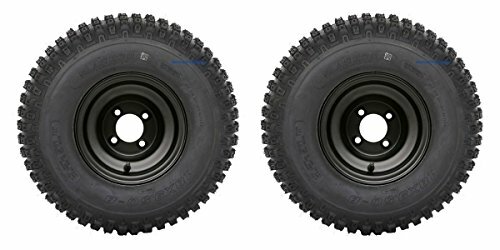 These 18x9.50-8 knobby golf cart tires will blast you through mud, grass, and other surfaces that require that extra bit of traction that a standard sawtooth tire lacks. TECH SPECS: Fits: ALL Golf Carts -- EZGO: Marathon / Medalist / TXT /ST / PDS / RXV / Workhorse CLUB CAR: DS / CARRYALL / PRECEDENT YAMAHA: All G MODELS / DRIVE(G29) Tire size: 18x9.50-8 Tire height (ground to top of tire): 18 inches Ply Rating: 4 ply Wheel Offset: Standard (3.5" back, 3.5" front) Bolt Pattern: 4x4 (101.6mm) Order with confidence! 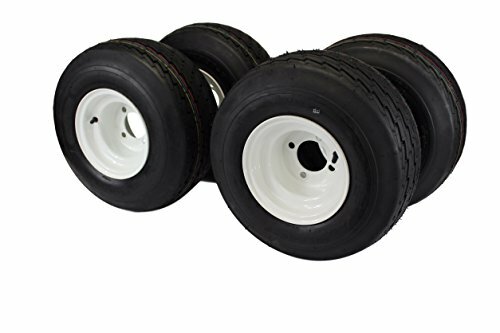 Set of 4 Tire and Wheel Assemblies *** Wheel Color: White *** Wheel Size: 8x7 *** Pilot Hole: 2.83" *** Number of Bolt Holes: 4 *** Bolt Hole Size: .590" *** Bolt Circle: 4" *** Offset: Centered *** Tire Size: 18x8.50-8 *** 4 Ply *** Tread Code: ATW-009 *** Non-Directional *** DOT Approved *** Tire OD: 17.72 Nom *** Tire SW: 8.46 Nom *** PSI: 22 *** Load Rating at 10 mph: 815 lbs..
For over 60 years, Martin Wheel has provided quality products at a competitive price. 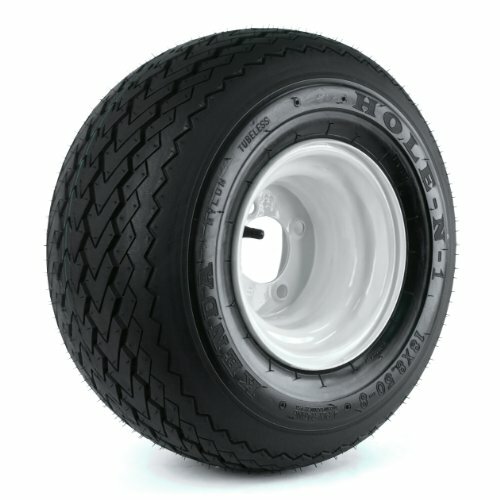 Here is the best replacement wheel and tire assembly for golf cart or utility use. The White Powder-Coat finish resists chipping, scratching, fading and corrosion for a great appearance and longer life. Lug nuts sold separately. Perfect for your stock or non-lifted golf cart! 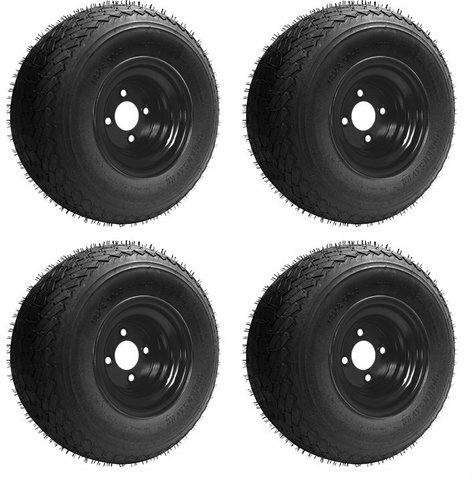 Our 18x8.50-8 Wanda/"SLASHER" TURF Golf Cart tires will perform better on the turf than standard sawtooth tire. 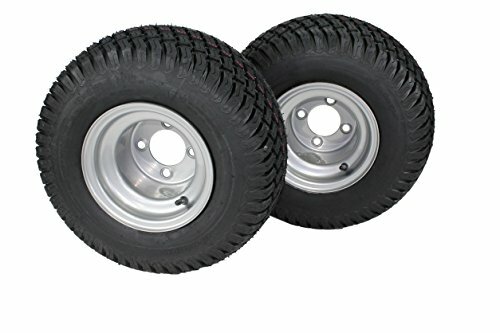 Gentle on your lawn while providing good traction on pavement.This set of wheels and tires come professionally mounted on our 8" White Steel wheels to make installation quick and easy! Your order will include: (4) Brand New 18x8.50-8 WANDA/ "Slasher" Golf Cart Turf Tires (comes mounted on the wheels) (4) 8x7" White Steel Golf Cart Wheels TECH SPECS: Fits: ALL Golf CartsEZGO: Marathon / Medalist / TXT /ST / PDS / RXV / Workhorse CLUB CAR: DS / CARRYALL / PRECEDENT YAMAHA: All G MODELS / DRIVE(G29) Tire size: 18x8.5-8 Tire height (ground to top of tire): 18 inches Turf Safe: YES Ply Rating: 4 ply Load Rating: 815 lbs @ 22 PSI Bolt Pattern: 4x4 (101.6mm measured diagonally) Order with confidence! **These assemblies fit any Golf Cart, Lawn Mower, UTV, ATV, or Trailer hub that is 4 bolt and measures 4x4" (4x101.6mm)**Fits ALL Golf Carts: EZGO: Marathon / Medalist / TXT /ST / PDS / RXV / Workhorse Club Car: DS / CARRYALL / PRECEDENT Yamaha: All G MODELS / DRIVE(G29) Other golf carts: Any bolt pattern that is 4x4 Order with confidence!